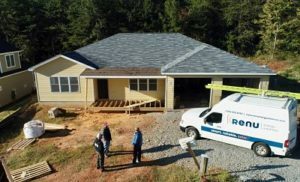 Clean energy has leapt forward in the Carolinas in recent years, and solar energy systems are now popular among homeowners. Renu Energy Solutions is here to help homebuilders understand the benefit of incorporating solar into new construction, particularly by choosing the efficiency and aesthetics of SunPower panels, which deliver the greatest value. The economics of solar are excellent for residential electric customers across the Carolinas. Gone are the days when solar panels were a luxury, reserved for only the most dedicated eco-conscious consumers: The market for clean energy is mature and the technology is proven, as these recent success stories show. System configuration that ties into electric grid – in many areas of the Carolinas customers are credited the full retail price for surplus energy they contribute to the grid. When a builder opens up the conversation about solar power with a customer, it’s an opportunity to alleviate concerns about utility bills in the home, and to envision the years of energy the panels will produce. Let us show you our commitment to consistently flawless installations, our readiness to deliver on the construction schedule you set, and our willingness to help you and the homeowner navigate available low-interest loan programs. The homeowner may be surprised at the thought of rolling the solar system installation purchase price into the home loan, with tax-deductible interest. This is practically always a big win for the customer, with a barely-noticeable increase in the mortgage, as Renu Energy Solutions can demonstrate. In return they’ll realize a significant reduction in utility bills, for 25-40 years or more. Ready to Offer Solar to Your Clients? Call or Stop By Renu Today! Visit our office at 801 Pressley Road, Suite 100, Charlotte, or give us a call at 704-525-6767 and we’d love to hear what aspects of residential solar power interest you as a builder! We are also available at our Jamestown, NC location, or to meet with you in the Greenville/Spartanburg or Columbia areas.